First War for 100 Years - As Argentina went to war for the first time since the Paraguayan War of 1865-70, the Navy and Marines would spearhead the invasion on Friday 2nd April 1982, the Army would garrison and finally lose the Falklands, and the Air Force, which could possibly have won the coming Anglo-Argentine war, got ready to establish a presence there. .... a large proportion of which were at sea on the eve of invasion. Under the overall command of Vice Admiral Juan Lombardo, most sailed by Friday 26th March from the main base of Puerto Belgrano. ... while the landings took place from the ships of amphibious Task Force 40. Before being recalled to join TF 40, frigates "Drummond" and "Granville" had earlier left for South Georgia, while fleet transport "Bahia Buen Suceso" had already returned to Argentina from there. Marine Corps or Infantaria de Marina - The Navy also included a 6,000 strong Marine Corps or Infanteria de Marina organised into two Fleet Marine forces, each with two infantry battalions and supporting arms. It was from these, that the assault commandos or Buzos Tactico and the landing force of some 800 men of the 2nd Marine Infantry Battalion were drawn. Another battalion was later deployed near Stanley. Tracker anti-submarine aircraft and Lynx, Alouette and Sea King helicopters. Carrier "25 de Mayo" first sailed with Skyhawks and Trackers embarked, but these were later landed, and together with the Super-Etendards, moved to southern airfields. Flying from there, three of the Skyhawks were lost in combat, and of the six MB.339's and four Mentors flown to the Falklands and operated from Stanley or Pebble Island, only one MB.339 survived. Argentine Coastguard or Prefectura Naval Argentina (PNA) - Separate from the Navy, the PNA operated its own aircraft and over 40 patrol vessels. The one Puma helicopter, two Skyvan light aircraft and two patrol craft transferred to the Falklands were also lost. 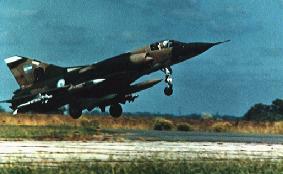 Argentine Air Force Mirage Argentine Navy Super Etendard. 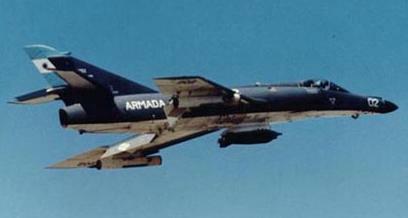 The four operational aircraft mounted a series of attacks on the British Task force with Exocet missiles, sinking destroyer "Sheffield" and aircraft/helicopter support ship "Atlantic Conveyor"
Army or Ejercito - Although a professional army in South American terms, a weakness in comparison with the British land forces was the predominance of one year conscripts in the ranks. Total strength was 60,000 including 20,000 regular officers and NCO's. Organised in to five corps, the main operational unit was the brigade of which there were around two armoured, one mechanised, four infantry, three mountain, one jungle and one airmobile, each consisting of three battalions plus one artillery and one engineer battalion. In addition there were five anti-aircraft and one aviation battalions. The Army (with the Marines) employed on the Falklands, Panhard armoured cars, 105 and 155mm artillery, 20mm, 30mm and 35mm AA guns, and Roland, Tigercat and Blowpipe SAM's. Occupation Forces - With the islands secured by the Marines, a relatively small Army garrison was air-lifted in to Stanley, but once the British Task Force was on its way, army strength built-up to over 10,000 troops. Of these, a reinforced brigade of 8,000 men from five regiments together with artillery, AA, armoured car and engineer units stayed in the Stanley area. Nearly 1,000 infantry with AA and some artillery went to Goose Green, and over on West Falkland, Port Howard and Fox Bay each received 800 men of an infantry regiment plus engineer support. Many were killed or wounded and the rest captured with all their surviving equipment. Army Aviation Command or Comando de Aviacion del Ejercito - Equipped with aircraft and a large variety of helicopters, many of which were deployed to the Falklands and all lost - two Chinook CH-47C's, five Puma SA.330L's, three Agusta A-109A's and nine Iroquois UH-1H's. Learjets, Boeing 707's and a number of other aircraft and helicopters. As soon as the assault forces landed, the Hercules started a job they continued to the very end; flying into Stanley the men and materiel vital to the Argentine defence of the Falklands. Eventually transferred to the islands were 24 Pucaras at Stanley, Goose Green or Pebble Island, and two Bell 212 and two Chinook helicopters. All but the Chinooks were lost. As the British Task Force headed south, the FAA transferred many of its aircraft to southern mainland bases and by the time the war was over had lost 32 Daggers, Mirage and Skyhawks, two Canberras, a Hercules, a Learjet and one more Pucara. Added to the Navy, Coast Guard and Army casualties, Argentina lost a total of 100 aircraft and helicopters.